RS, as the name suggests, has a high quotient of edgy sports styling that comes with all-round disc-brake set-up for dynamic handling and braking. Sports hatchbacks are the flavour of the season. So Maruti Suzuki has taken a leaf out of its sporty DNA to add a powerful 1.0L BoosterJet Direct Injection Turbo engine to its Baleno hatchback line-up. The car, eagerly awaited by motoring enthusiasts, will be launched on March 3 in India. And its booking has commenced with a token advance payment of Rs 11,000. The RS is also the first to be shipped back to Japan from the Gurgaon-Manesar factories, to be sold in Maruti's parent Suzuki Motor's outlets. The logic is simple as the 1-litre petrol car generates 100.5 bhp of raw power (150Nm@1700-4500rpm) for effortless driving in any traffic condition. The engine will come with a five-speed manual gearbox and a possible automatic in the future. With 950 kg in kerb weight, it is substantially lighter than other sporty competitors like the Fiat Abarth Punto and the Volkswagen Polo GT TSI. A standardised safety package in the RS complies with future safety norms, including pedestrian safety, side impact and frontal offset impact, and also includes dual airbags, ABS and EBD, and seat-belt pretensioners. To up the Baleno's style quotient, it gets black, 16 inch alloys. 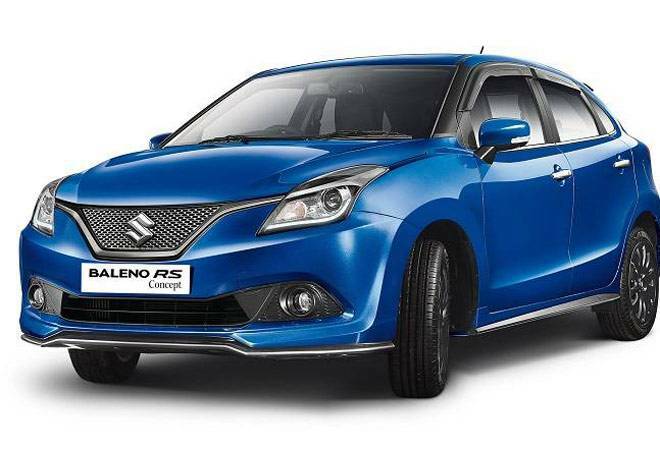 The Baleno RS will be launched in a single variant, equipped with SmartPlay infotainment system.